Broughty Ferry is an attractive dormitory town and resort on the north shore of the Firth of Tay some four miles east of Dundee, of which it now forms an eastern suburb. At various times it has been called "The Brighton of the North" or "The Jewel in Dundee's Crown", and it remains a magnet for visitors, being only a short distance from Scotland's fourth city. It is likely that a community lived on and fished from this part of the north shore of the Tay by the early 1400s, when a small ferry crossed the Firth of Tay between what was originally known as Partan Craig or "Crab Rock" and what is now Tayport in Fife. Later that century the strategic importance of the location was recognised and in 1454 the 4th Earl of Angus was granted permission by King James II to build a castle here. It is unclear what form this first castle took or how large it was: it may not have been very substantial. In 1490 the second Lord Gray was given permission to rebuild the castle. Judging by a date that is recorded as having been inscribed on the wall of the castle until later alterations, building work continued until 1496. Broughty Castle featured most centrally in Scottish History in the three years up to 1550. In 1547 Lord Gray was a supporter of the invading English army against the Catholic cause of the infant Mary Queen of Scots (see our Historical Timeline). The English arrived by sea at Broughty Castle on 20 September 1547, two weeks after they had defeated the Scottish Army at the Battle of Pinkie. The castle was surrendered to them, and the English immediately set to work on improving its fairly weak defences, mainly by digging a defensive ditch across the landward approach to the castle and a subsidiary fort a short distance to the north on Balgillo Hill. It took until 1550 for the Scots, with French support, to recapture the castle. The damage to the castle was repaired and the Grays moved back in for a relatively tranquil hundred years. But in 1651 the family were backers of the Royalist cause in the Civil War, which resulted in General George Monck and his Parliamentary army attacking the castle on 31 August. The defenders fled without a fight. The Gray family sold Broughty Castle in 1666 and it slid slowly into obscurity and decay over the following century. It played no part in the turbulence of the 1700s, and was described as a ruin in 1787. In 1801 the local landowner George Hunter laid out a plan for a new town at what was by then known as "North Ferry". 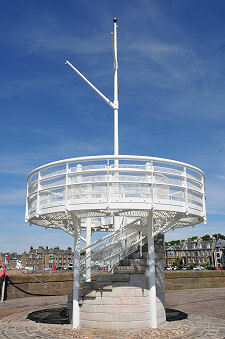 The grid pattern he developed was further extended in 1825, and Broughty Ferry began to take off. A shipyard and a lifeboat station soon followed, and then, in 1839 the Dundee and Arbroath Railway opened a station in Broughty Ferry, which rapidly became established as the most desirable place to live in or around Dundee. With the owners of the city's flourishing jute mills and whaling ships all wanting to relocated to Broughty Ferry it became know for a while as "richest square mile in Europe". This title may since have passed elsewhere, but the many grand Victorian houses built on the slopes rising above the northern side of the town remain an important part of what makes Broughty Ferry such an attractive place today. In 1846 Broughty Castle was purchased by the Edinburgh and Northern Railway Company, who then built the Broughty Ferry Railway Quay immediately to the west for the railway ferry used to transport trains across the Firth of Tay. This formed part of the rail link between Edinburgh and Aberdeen until the completion of the Tay Bridge in 1878, and again from the bridge's collapse in 1879 until its replacement was completed in 1887. Meanwhile steam ferries were introduced onto the crossing for other traffic wishing to travel across the Firth of Tay. By 1900 steamers were carrying holidaymakers to (and from) places as distant as Perth, Montrose and Leith, and in 1905 Broughty Ferry was reached by the trams of the Dundee, Broughty Ferry and District Tramways Company. 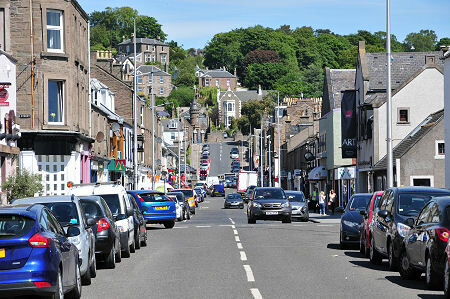 By now Broughty Ferry was more or less a suburb of Dundee. It is reported that on 14 June 1912, some 2,200 of the town's 2,674 registered voters (at a time when this meant property-owning or property-renting males aged 21 or over) travelled to work in Dundee by train or tram. In 1913 the town formally became part of the City of Dundee for administrative purposes. 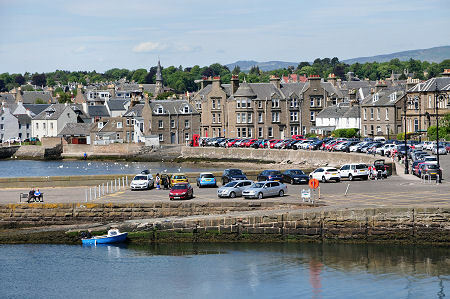 Today's Broughty Ferry is every bit as popular as its Victorian predecessor, though with the demise of the trams and the steamers, and only a limited rail service, parking tends to be at something of a premium whenever the sun shines. The northern terminus for ferries across the Tay shifted upstream from Broughty Ferry to Dundee a long time ago, before they ceased altogether on the opening of the Tay road bridge in 1966. Among the attractions on offer for residents and visitors are beaches, parks, a promenade, the castle, and a wide range of shops and opportunities to eat and drink. The area's nautical links are maintained by the presence of the RNLI lifeboat, the "RNLB Elizabeth of Glamis". A slate plaque on the side of the lifeboat shed commemorates the loss of the "RNLB Mona" with her crew of eight men in the early hours of 8 December 1959 in St Andrews Bay. A poignant reminder, if any were needed, that however calm and blue the sea looks when you visit, there are times when it can get very wild indeed.